These days, many of us are looking for different ways to make our homes more energy efficient. Every year, homeowners spend more and more money on adding energy efficient windows to help reduce the amount of energy being used. Although that is great, some, however, tend to overlook one of the biggest impacts on saving energy in their home; new roofs. New energy efficient roofs have made it better for both one’s budget and the environment. I could tell you that small fractures in your home could greatly reduce your home’s energy efficiency. I could also tell you that the holes above your head aren’t safe and could possibly cause a lot of damage. Here’s what you don’t know: the three most important words for roof energy efficiency are insulation, insulation and insulation. Because your roof receives direct sunlight mostly, the attic space right below it heats up the fastest–thus making it the hottest room in the whole house. While that doesn’t seem like an important problem, it could be. Keeping the heat from seeping into your home is key to energy efficiency. By installing insulation in your home, it will help to block out the heat. Ultimately, you’ll be saving a lot of money in the long run when you improve your home energy efficiency. Even though many people go the insulation route, hardly anyone ever considers installing a new roof together with it. 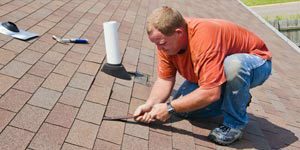 There are many benefits to installing a new roof, but one that will forever stick is that it is a great investment. New lifetime guaranteed shingles get you there. Instead of trying to cover up a mess with an even bigger mess is pointless. We here at Eastbrook Construction make sure that we not only do a neat and thorough job but that our customers are satisfied. If your are looking for a new roof in Howell or Brighton area and are looking for a way to help reduce your bills this summer, contact us. We’ll get the job done. This entry was posted in New Roof and tagged energy efficient roofs, new roof insulation, new roof reduces energy costs, new roofs brighton, new roofs howell. Bookmark the permalink.